These help with the stability and flexibility of the shoulder and joints. Under the rotator cuff at the front of the shoulder is the long head of the biceps; through which the bicep muscle is attached above the glenoid on the scapula. Parts of the rotator cuff and long biceps tendon pull through an anatomical narrowing known as subacromial narrowness. Rotator cuff tears – which occurs when one or more of the surrounding muscles, tissues or ligaments that make up the rotator cuff tear, either due to a heavy external impact e.g. fall or dislocation or micro tears that gradually increase over time. 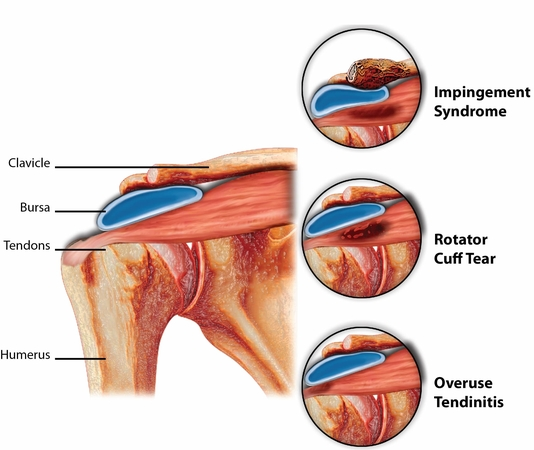 Rotator cuff tendonitis – refers to the inflammation of the tendons surrounding the rotator cuff in the shoulder. It is usually related to repeated shock or trauma to the area leading to the tendons being swollen. Rotator cuff impingement – also known as subacromial impingement, this is usually caused by the trapping or squeezing of certain tendons/ligaments making up the rotator cuff, which causes inflammation and subsequently pain. Subacromial bursitis – occurs when the bursa in the shoulder becomes inflamed, this is usually caused by repeated overuse of the shoulder and is usually a leading cause of shoulder impingement. Prolonged immobilization of the shoulder joint due to long term injury or severe inflammation. Heavy loads on the shoulder joint e.g. after years of bench presses, deadlifts in the gym or work-related lifting of heavy goods. There are various factors that may increase the risk or likelihood of a rotator cuff injury, this includes age, genetic disposition, sport type (e.g. archery, baseball, tennis) or type of job role (e.g. carpenter, builder, painter). Identifying the causes of any pain or inflammation in the shoulder is essential to treating it effectively. Pain when lifting lighter loads e.g. lifting at work or during sports. Long term symptoms of the rotator cuff injuries include repeated inflammation due to shoulder calcification (also known as Bursitis calcarea or calcifying tendinitis) which can further restrict the mobility of the shoulder. A special form of rotator cuff injury is known as swimmer’s shoulder, suffered primarily in sports where there are repeated and increased overhead loads. This affects those in sports such as volleyball, handball, swimming, tennis, badminton, and squash. Shoulder pains are usually not serious conditions and most resolve themselves within a few weeks, if however the discomfort does become persistent in the shoulder region or you start to experience a sudden sharp pain when lifting a load or exercising then you should visit your doctor for a medical diagnosis in the case there may be an underlying health concern. When you see the doctor, he or she will start off with a physical examination to understand the problem. The main pain points will be identified especially around the shoulder level, with irritation of the long bicep tendon sometimes at the front of the shoulder joint. This can be done by raising the arm sideways, upwards and flexing of the biceps, this will provide an indication as to the points which are irritated or injured. An X Ray scan would also be conducted to discover any possible causes of the rotator cuff injury such as arthritis or bone spur. Through an ultrasound, the doctor can detect pathological changes of the shoulder soft tissues as tendonitis or defects of the rotator cuff. Radiographs are done to exclude bony injury; whilst displaying possible calcification in the tendon or bursa. Sometimes the exact evaluation of complaints requires a CT or MRI scan of the shoulder, which will provide a highly detailed structure of the shoulder so as to ascertain what the exact cause of the injury is. The first step in treating rotator cuff injuries is to ice and rest the area of the shoulder that is in discomfort. Wet or cold packs can be wrapped around the area to reduce swelling, alternatively while lying on the a heat pad can be placed under the shoulder to help relieve the most painful, nocturnal pain. Another base treatment is to begin to introduce slow, regular motions of the shoulder below the pain threshold. Be aware though that forced physiotherapy and massages can further worsen the pain rather than alleviate it. If diagnosed by a doctor, a course of painkillers and NSAID are most likely to be prescribed to help relieve the pain quickly. Relief injections may also be administered for severe pain, with the use of local anaesthetics such as lidocaine or corticosteroids. If conservative treatments fail to successfully treat the rotator cuff injury, then it is possible to eliminate the subacromial narrowness surgically. In this case, the doctor partially removes the bond between the coracoid and protruding bone usually under an arthroscopy. Another arthroscopic surgery is the sealing of small rotator cuff tears. This measure makes sense only in relatively recent cracks and among younger, physically active people. After a suture has been made at the affected area the individual needs to rest and slowly rehabilitate the shoulder passive (guided) exercises to prevent stiffening of the shoulder. The timeframe of recovery from such a surgery is usually 4-6 weeks where after exercise can begin, full recovery can be expected after 10-12 weeks. If the tendon sheath is generally worn and thinned especially in the elderly, it is impractical to create a seam with the crack. In this case, it is better to replace the affected part of the rotator cuff with a muscle strip from a back muscle. In cases where large calcium deposits have occurred as a consequence of long-term chronic irritation, a rinse is usually required. Most of the time, the problem will resolve itself in a few months if the person avoids nociceptive movements. Athletes in sports that regularly utilise the shoulder are advised to train consciously with a specified training plan, aimed at effectively strengthening all the shoulder muscles equally. Stretching the shoulder muscles is important in preventing any further or future rotator calf injuries.